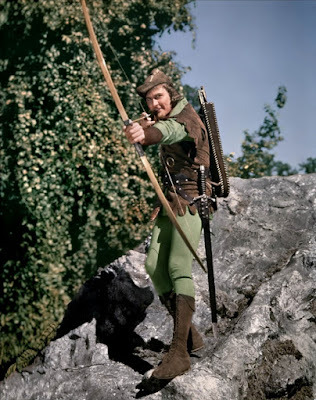 Errol Flynn robs from the rich to give to the poor in the Technicolor masterpiece, The Adventures of Robin Hood. The Stars: Errol Flynn, Olivia de Havilland, Claude Rains, and Basil Rathbone. Source Material: The works of Sir Walter Scott and the 1922 Douglas Fairbanks movie. A wardrobe test for Olivia de Havilland as Maid Marian in The Adventures of Robin Hood. Awards: Received an Oscar nomination for best picture and won three Oscars for best art direction, best editing and best original score. The Plot: Robin of Locksley (Flynn) and his band of merry men battle the corrupt Prince John (Claude Rains) and Sheriff of Nottingham (Melville Cooper) in medieval England. Backstory: Warner Bros. planned to make a Robin Hood film with their No. 1 star James Cagney, but when Cagney walked out on the studio in a contract dispute they handed the role to Errol Flynn, who made quite a swashbuckling impression in Captain Blood (1935). 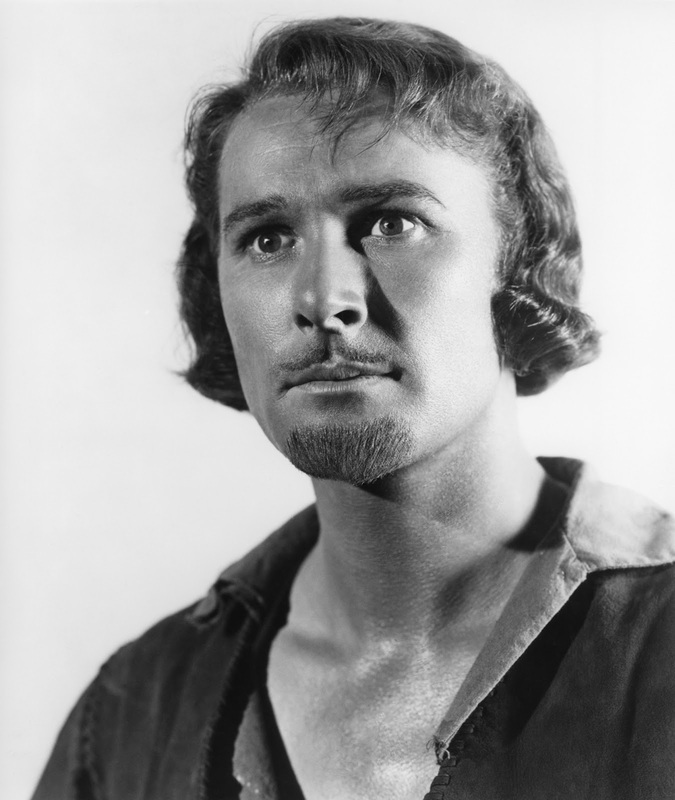 Best Performance: Errol Flynn as Robin Hood. This was a tough one because there's so many great performances in this movie. 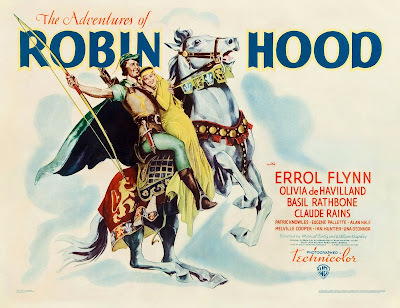 De Havilland is perfection as Maid Marian, Alan Hale was never better as Little John, and Basil Rathbone is the last word in mustache-twirling villainy as Sir Guy of Gisbourne, but this movie would have fallen flat on its face without the considerable charm of Flynn. It's no secret that I believe Cagney is the greatest American screen actor, but he was all wrong for Robin Hood in both looks and temperament. Flynn was not a great actor, but he was a great movie star, and he brings such joy to his performance that it overflows onto the audience even 77 years later. Best scene: Robin joins an archery tournament in disguise (clip below). 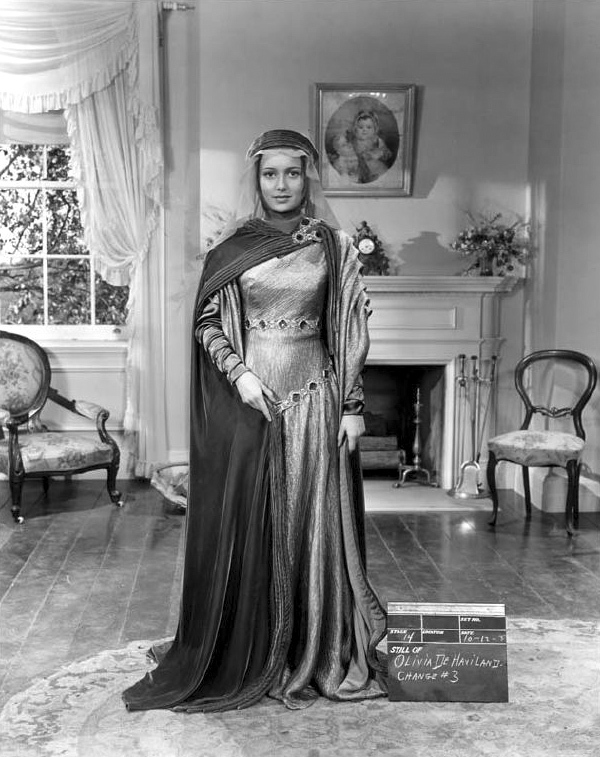 Best Line: Maid Marian: "Why, you speak treason." Robin: "Fluently." Location shooting: The Adventures of Robin Hood was filmed on several locations in and around southern California. Bidwell park in Chico substituted for Sherwood Forest, but art director Carl Weyl added plaster of Paris trees and rocks to get an even more woodsy feel. Big Chico Creek was used for the fight scene between Friar Tuck (Eugene Palette) and Robin, and the company also filmed at the Warner's ranch in Calabasas and Sherwood Lake and Sherwood Forest in the Santa Monica Mountains (those areas got their name because the 1922 movie was shot there). 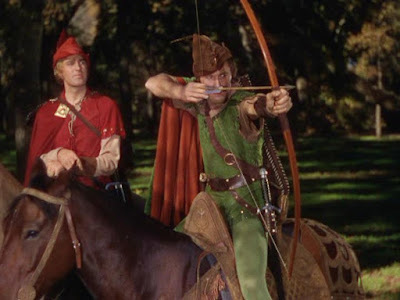 Will Scarlet (Patric Knowles) and Robin (Errol Flynn) get in some target practice in The Adventures of Robin Hood. Archery: Robin and his merry men are of course expert archers, so Warner's brought in noted archer Howard Hill for the production. Hill is the one doing all the trick shooting in the scene above, and he actually appears as the character of Elwyn the Welshman. A great tidbit from the American Film Institute notes says that extras were paid $150 more if they let Hill shoot them with arrows. The AFI notes don't give any indication if padding was involved, but I certainly hope so. Fun Fact: Roy Rogers' famous horse Trigger made his movie debut in The Adventures of Robin Hood as Maid Marian's steed. Errol Flynn in a publicity still for The Adventures of Robin Hood. Availability: The Adventures of Robin Hood will air at 8 p.m. Aug. 2 on TCM. It is available on Blu-ray, DVD and video on demand.